As the 19th century rattled into history books, the Belle City of the Great Lakes bustled with commerce, farm harvests and residential expansion. Its principal connection to other cities and other markets, 23 miles south of Milwaukee and 62 miles north of Chicago, was via Chicago & Northwestern Railway, its freight trains hauling away farm machinery designed and manufactured in Racine, Wisconsin and delivering essential materiel to supply the forges and factories. Its passenger trains carried Racinians to a host of dynamic cities along the Lake Michigan shoreline, to myriad inland cities in Wisconsin and the Michigan Upper Peninsula, and to the national focus of train travel at Chicago. Befitting a proud city on the busiest Wisconsin main line of the railroad company which operated more trackage in the Badger state than any other company, an elegant station built sturdily of concrete, brick and hardwood timbers hosted passengers arriving and departing on C&NW trains. By 1968, however, most destinations were reached via automobile or jet airliner, so passneger trains were rapidly vanishing everywhere in America. Chicago & Northwestern Rwy. was at the forefront of railroads ridding itself of them, and its trains stopping at Racine dwindled to fewer than ten. With the advent of Amtrak in 1971, they were all gone. Once years of accumulated unkempt vegatation was cleared from around it, Racine's historic landmark train station stood in 2000 undaunted by so much neglect. The former home factory printing Golden Books for children stands in lighter red brick nearby, a larger symbol of diminished commerce and prosperity for city of Racine. Farm tractors, garbage disposers, and sundry other manufactured products generated thousands of prospering jobs in an earlier, train-centered era. Rebirth of the city and its transit is underway in 2003. 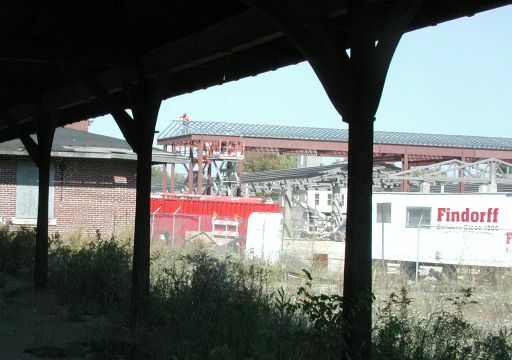 For the next 30 years, the sturdy brick station and its adjoining passenger canopies and platform stood in solemn, silent testament to the grandeur that Racine industries and residents once deserved from the city's principal railroad. And, like that railroad which in the mid-1980s removed one of two main tracks and all the train-controlling signals as freight traffic dwindled to unimagined scarcity, Racine slid into marginal economic viability, its factories less and less active; many of its employers no longer leading their industy markets, and therefore no longer able to pay lucrative salaries and wages to families increasingly displeased with their plight, with their city's plight. When historic landmark designation was achieved at the behest of state Senator Joseph Strohl and local preservationists, the old station was not well-maintained by a single, private owner who bought the property for its land. Landmark status didn't reverse its decline, however, and decades of friction surrounding the station continued. City of Racine at one point in the 1940s refused C&NW requests to vacate a street literally at the station's doorstep, severely limiting parking and the railroad's ability to acquire adjoining properties. Controversy had also attended construction in the early 1950s of a Post Office Annex, close by the station so railcars carrying U.S. Mail could be conveniently removed from and added to passing passenger trains. Fifteen years later, all those trains were history and mail was hauled in trucks and airplanes. 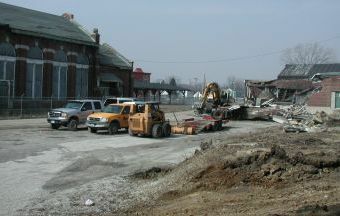 Eventually, a consensus among local business leaders, city government and transit leaders coalesced in the late 1990s into determination to purchase the old station and its surrounding land, acquire and raze the former Post Office Annex and several decrepit residences adjoining it, then to construct a local and regional transit hub in the pattern established by Congress with the Intermodal Surface Transportation Efficiency Act (ISTEA) in 1991. Successive stages of requesting proposals, determining worthy bidders, waiting for funding and approval, then contract bidding and letting followed. 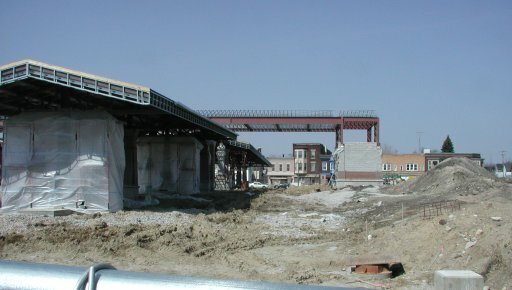 By March, 2003 the paperwork and cogitating were almost over and the first signs of progress appeared -- as demolition of several structures, including the half-century old postal annex. Late in 2003, Wisconsin DOT reaffirmed its commitment to significantly fund renovation of the historic building. By late September, Belle Urban System transfer center is taking shape. 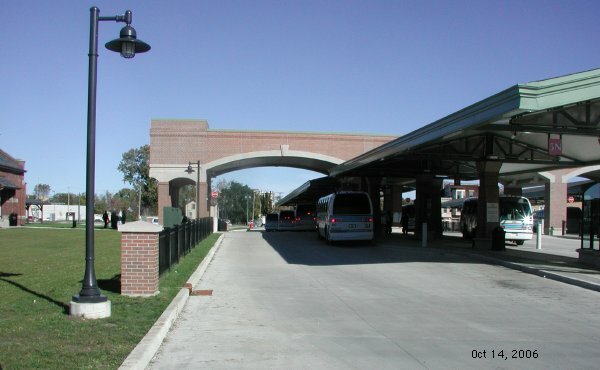 Racine's new bus transfer center adjoining the former Chicago & Northwestern Rwy. train station is centrally located and readily accessible to a primary north-south thoroughfare, Memorial Drive, and near the intersection of State Street and Northwestern Ave, which together are State Hwy. 38. New construction in the city's established neighborhoods has spread from renovation of its harbor and lakefront properties in the 1980s and 1990s, with complete reconstrcution of State Hwy. 32 through downtown Racine nearing completion. Newly located corporate offices facing Monument Square in downtown highlight the impetus for revitalized use for central-city properties, which is also evident at the Belle Urban System transfer center. Kenosha-Racine-Milwaukee commuter trains, recommended by SE Wisconsin Regional Planning Commission in August, will also enhance urban and inter-urban travel at this new location. 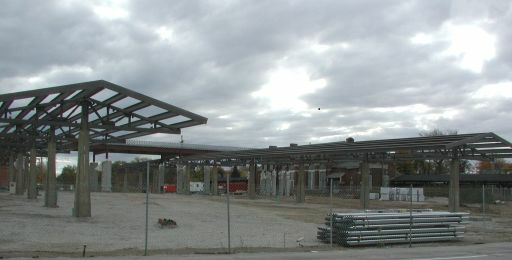 With one week of October past, chill winds and colder rains are likely soon as steel framework of the Belle Urban System transfer center takes shape. 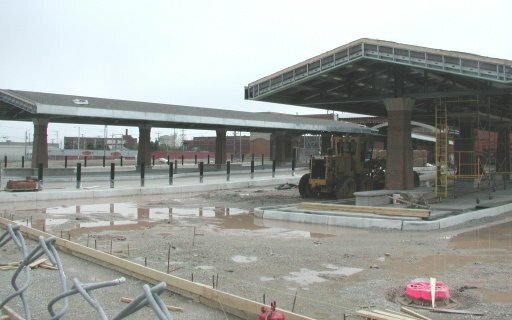 Workers hasten to finish that early construction phase under sunny skies at Racine's new bus transfer center adjoining the former Chicago & Northwestern Rwy train station. 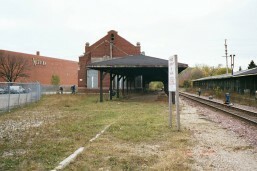 Once the transfer center is functional, Racine will turn its attention to renovating the historic brick station, presently connected to unused, badly dilapidated passenger canopies, almost a century old. Start up of K-R-M commuter trains in several years will bring new vitality to the transfer center and to the old station. As gray steel framewwork and clouded gray skies prevailed at the site in late October, 2003, the chill of winter is becoming palpable. Its slippery snows and frosty work days plainly imminent. At mid-January, 2004, temperatures slid below -10 C (14 degree F) but rose near freezing one week into the New Year at Racine. Cold isn't enough to entirely halt work along State Street, as this J.I. Case power hoe loads excavated dirt just outside the perimeter fence around the Belle Urban System transfer center. J.I. Case corporate offices, less than a mile away for more than a century, hold more historic value for this "Rust Belt" city than the former Chicago & Northwestern train station, slightly visible behind the new bus complex rising on land cleared last year. Reinvgorating the once-bustling thoroughfare began in the 1980s with significant co-operation from J.I. Case executives, and continuing progress toward robust economic vitality is anticipated as public transit focuses new commerce arteries here. By mid-February, the warming sun as midday nears adds encouraging brilliance to the newly unwrapped brick on a pillar of the new Belle Urban System transfer center. Racine anticipates completion for the center's construction by mid-summer. A mid-summer date also is expected for starting renovation and modernization of the historic train station, at left of picture. Planning for that long-sought repair of the former Chicago & Northwestern Rwy. depot is almost complete, and project bidding should follow in coming weeks. Historic State Street buildings face south into warming late-March sun beyond the canopies for the new Belle Urban System transfer center which continue rising beside the former Chicago & Northwestern Railway passenger station. Renovation of the station for use when K-R-M commuter trains begin running in several years will begin later this summer. The BUS transfer center may reach completion as early as mid-year, about June 30. Clouds cleared partially in March as milder temperatures allowed more progress each day. 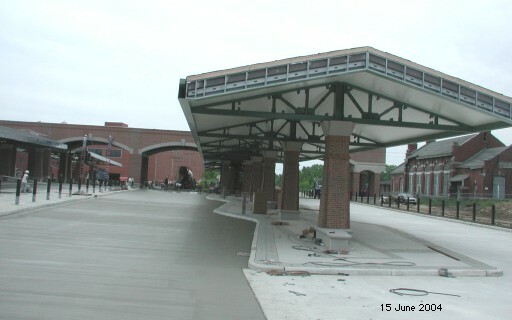 City of Racine and Findorff Construction continue striving for June 30, 2004 completion of the new State Street transfer hub for Belle Urban System buses, though exceptional rainfall of monsoon amounts in May has hampered much of the remaining work (see photo below). When complete and in full use, the center will serve regional and interstate buses beside BUS buses. Out of sight to the right, the former Chicago & Northwestern Rwy. station renovation will soon go out for bidding by contractors. 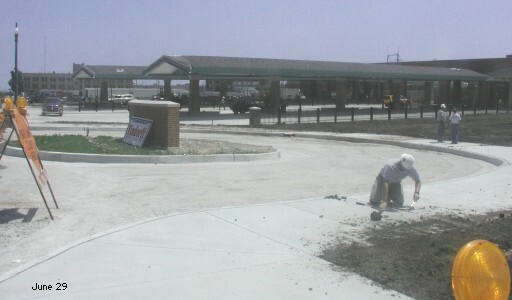 City of Racine arranged federal and state funding for the station project and for the Belle Urban System facility shown here. Compatible brick work of the BUS center, of former production home to Golden Books in the distance, and of the train station immediately west combine to project an upscale motif which will grow eastward along State Street to already-renovated city blocks along Root River and on Main Street. At mid-June the rains have halted long enough for the puddles and small ponds on the BUS construction site to soak in and away, which city of Racine and Findorff Construction agree will make completion by July 31 feasible. 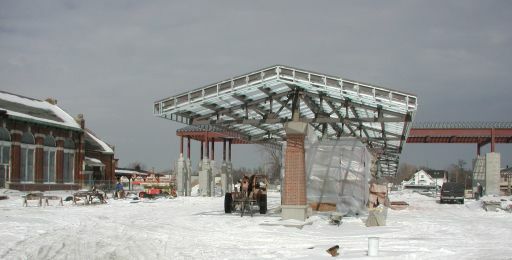 When placed into daily use, this new transit center for Belle Urban System buses will become a hub of public transit for the area, a single, central location for BUS, Wisconsin Coach, Greyhound and later K-R-M commuter trains, operating as extensions of northeast Illinois Metra Northline service. As June wrapped up and completion of the Belle Urban System center by the end of July seemed assured, attention shifted from pouring concrete to spaces framed by its slabs. 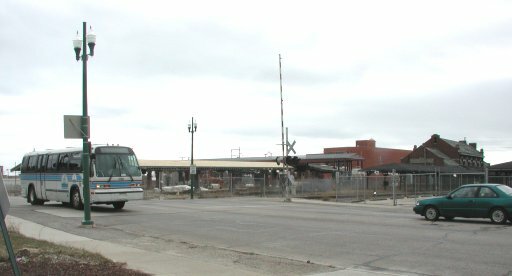 Racine eagerly anticipates regular use of its bus hub, which is most proximate to the prospective K-R-M train stations among its partner cities, Kenosha and Milwaukee. Thoroughly studied and broadly endorsed by public opinion and by business and environmental groups alike, K-R-M support by a wide range of prominent leaders, including the late Sam Johnson, gave the concept and crafting of its implementation plan greater visibility. Once adopted formally in August, 2003 by SouthEast Wisconsin Regional Planning Commission, K-R-M commuter trains became viable in their own right. 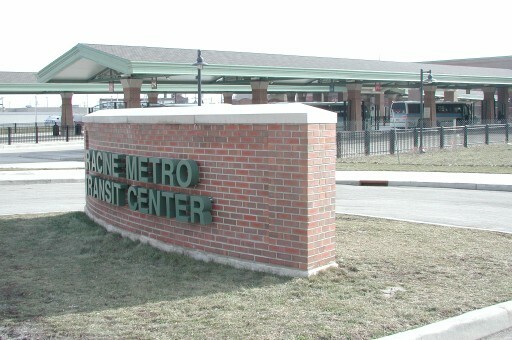 Racine's BUS center adjoining the K-R-M station highlights the ongoing investment for regional public travel, for intermodal travel. One and one-half year later in January, 2006, the station anchoring so much new constructon nearby  at the BUS transfer location and for retail customers of Walgreen and McDonald's, to name two  itself is now benefiting from fresh interest, fresh invesment in its walls, roof and interior. After two full years of use, the B.U.S. transfer hub has proven the value of well-planned location and configuration. On a typical Saturday morning its buses converge here hourly. But a one-time event at the adjoining train station makes this Saturday unique. The 1902 station (slightly visible at left) was dedicated anew for public uses, now for bus riders and in a few years for sheltering bus and commuter train riders, once KRM trains begin operation. The following web pages no longer exist; their links are broken.